The Ghost Pepper is one of the hottest exotic peppers around. Combine this potent pepper with tortilla chips and we may have an explosively hot snack. 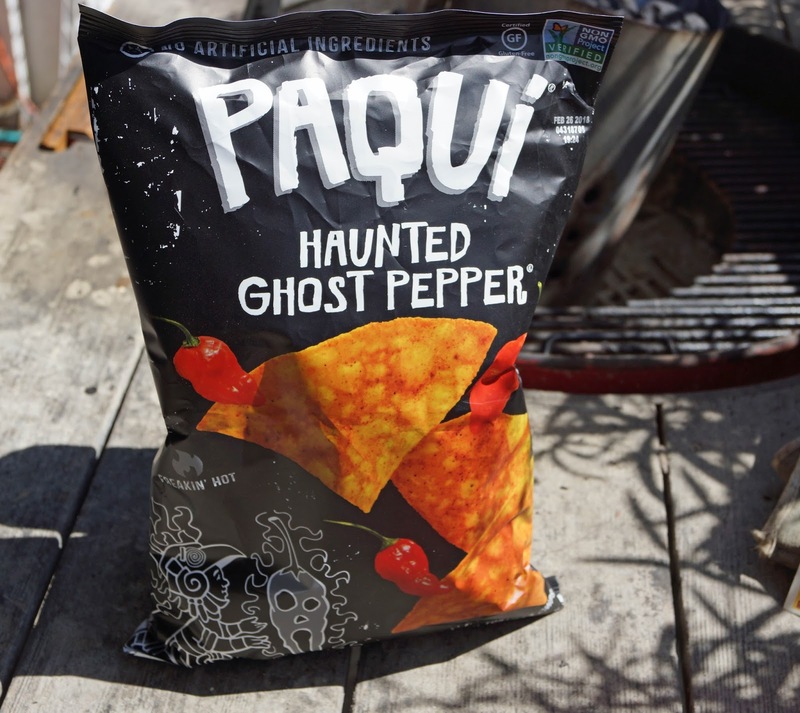 My fellow bbq judge friend Jon gifted me a bag of Paqui Haunted Ghost Pepper tortilla chips and we are going to give them a try. We are no strangers to the Paqui brand and have enjoyed their products in the past. Paqui describes their chips: " Light, crispy and freakin hot! Witness the Haunted Ghost Pepper, the scariest of them all. These chips will terrify your taste buds. Ours are still hiding under the bed". We shall see. I briefly looked at the ingredient list and Ghost Pepper is listed as one of the first ingredients. The Cayenne and Chipotle Peppers are also listed in this list. We open the bag to reveal a fresh aroma of spices and tortilla chip like smells. I take a bite of this fresh crisp orange-ish colored chip. . I immediately feel heat all over my mouth. The instant heat I believe is from the cayenne. I can also taste the smokiness of the chipotle. The Ghost pepper flavor is present in the lingering after burn. This chip is hot. My sinuses started to run which is my personal heat alarm. I love these chips. The heat meter will actually rise to three and one half stars out of 5. Once you have got over the heat rush you will realize these chips are flavorful and balanced with its salt and spice mix. Like other snack products you will crave another chip. These chips are not for everyone. They are hot. I challenge you to be brave and enjoy the heat. I love them. Instead of mouth watering, this is a tongue rolling article. The spicy taste of these peppers is quite vividly described. The pictures don't make them look so hot but I guess looks are deceiving.